With a 600 pound weight capacity, this bariatric battery-powered lift with (non-removable) rechargeable battery by Drive Medical has strength on its side. The extra wide, coated cradle rotates 360 degrees and includes 6-point hook up. 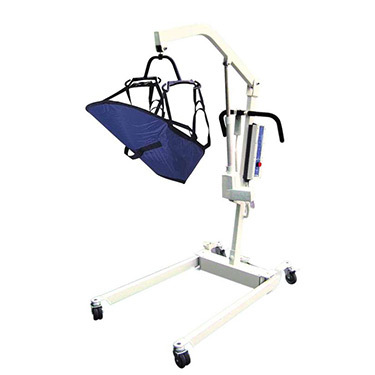 A high lift range allows the unit to transfer patients to high surfaces. The battery can be charged by plugging in the unit, and never needs to be removed. (The lift will not operate while plugged in.) A jumbo actuator pump that lowers the patient ensures safe re-positioning. The pump even includes an emergency button and can be switched to manual mode. Sturdy base legs ? with dual, 3" heavy duty front casters adjust easily and lock securely into open position with padded shifter handles. The product is protected by a lifetime warranty on the frame and a 1 year warranty on components and electrical parts. (Unit includes: removable rechargeable battery (Model #13258); external charger (#13255) and wall-mounted bracket (#13260).) Patient lifting slings not included.